Riley Robinson, pictured right, was killed and her sister severely injured after the ATV they were riding on crashed into trees. The family of a Michigan girl killed in a tragic ATV accident – that also left her 14-year-old sister severely injured – said that she will have the chance to save six others since they have decided to donate her organs. Riley Robinson, 12, and her sister Peyton, had taken off on the recreational vehicles near their grandmother’s property in Missaukee County on Sept. 9, Fox 2 Detroit reported. Riley’s family decided to donate her organs, and found out they will help 6 others. Riley was airlifted to a hospital in Grand Rapids but later died from her injuries. 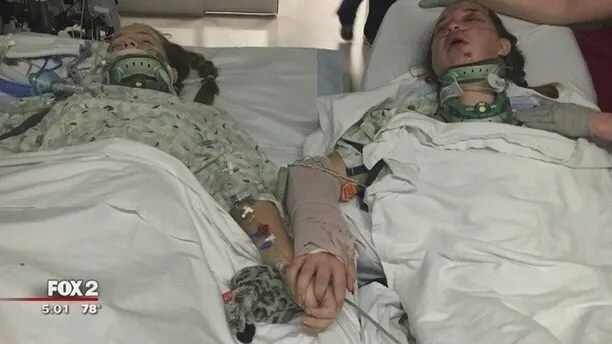 A devastating photo shows the pair side by side in their hospital beds. Payton suffered fractures in her arms, elbow and shoulder and is set to undergo facial reconstructive surgery. According to the news outlet, Michigan law requires riders under 16 to wear a helmet, complete a safety course and ride under adult supervision.